Your duplicate report has been submitted and will be reviewed within 24 hours. 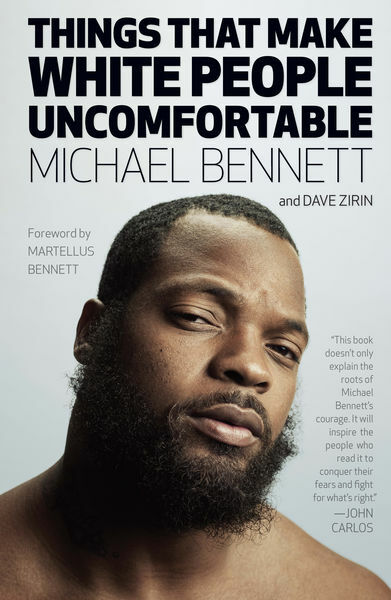 Super Bowl Champion and two-time Pro Bowler Michael Bennett is an outspoken proponent for social justice and a man without a censor. One of the most scathingly humorous athletes on the planet, he is also a fearless activist, grassroots philanthropist, and organizer. Written with award-winning sportswriter and author Dave Zirin, Things That Make White People Uncomfortable is a sports book for our times, a sports memoir and manifesto as hilarious as it is revealing. Bennett, a defensive end for the Seattle Seahawks, has gained international recognition for his public support for the Black Lives Matter Movement and women’s rights. Bennett donates all his endorsement money and half of the proceeds from his jersey sales to fund health and education projects for poor underserved youth and minority communities, and has recently expanded his reach globally to provide STEM programming in Africa. Dave Zirin has been called the “finest, most important writer on sports and politics in America,” by Dr. Cornel West, Professor of the Practice of Public Philosophy at the Harvard Divinity School. He is sports editor for The Nation and author of several titles for Haymarket Books, including his critically acclaimed book The John Carlos Story, written with 1968 Olympian John Carlos.